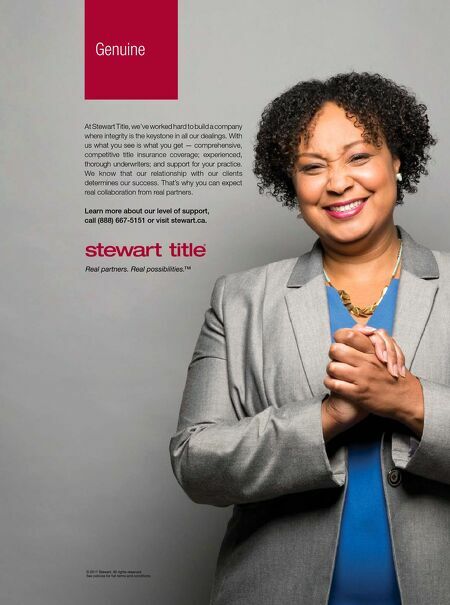 W Genuine At Stewart Title, we've worked hard to build a company where integrity is the keystone in all our dealings. With us what you see is what you get — comprehensive, competitive title insurance coverage; experienced, thorough underwriters; and support for your practice. We know that our relationship with our clients determines our success. That's why you can expect real collaboration from real partners. Learn more about our level of support, call (888) 667-5151 or visit stewart.ca. © 2017 Stewart. All rights reserved. See policies for full terms and conditions.